I have a kind of love-hate relationship with the topic of Digital Citizenship. I recognise fully that we have a responsibility to teach students how to interact positively, consider other people’s feelings, and be mindful of the impact our choices today have on our future. I see this as our responsibility to help shape good citizens full stop – not just good “Digital Citizens”. I love that aspect of being a teacher! 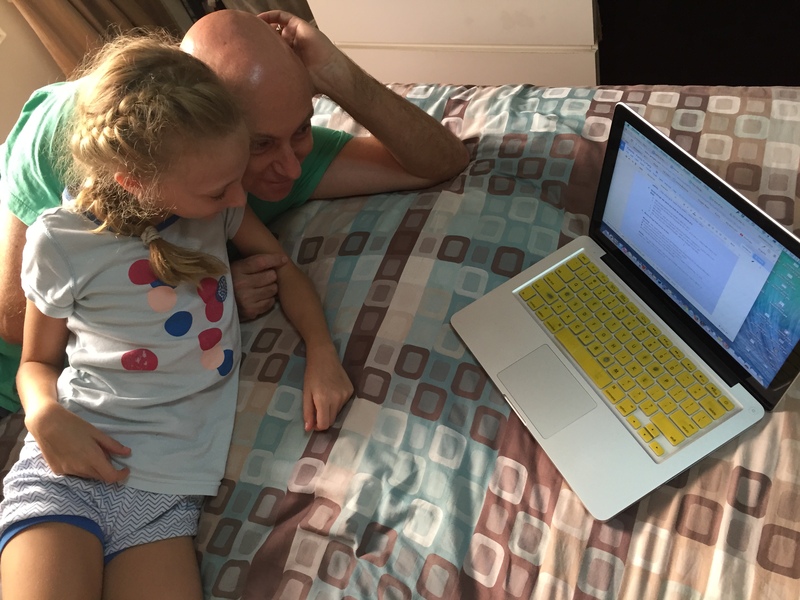 I have presented to parents a number of times on the topic of Digital Citizenship, and one of the things foremost in my mind when we start a workshop is to get both parents and children to recognise the positive things technology has brought to our lives. Technology is neither good, nor bad – it is the choices that people make with technology that make it so. When my husband and I reflected on how we were approaching the parenting of our two children (9 and 7), we realised that we had perhaps been too loose in our expectations given their age, and knew with the summer holiday moving ever closer, we needed to do something about it. One thing we were extremely conscious of was the need for any conversation with our kids to be seen as something they had equal part in, and something that was going to be a positive experience. We didn’t want to call a family meeting and then start laying down the law. At the same time, we had some issues to address, so careful planning was needed. 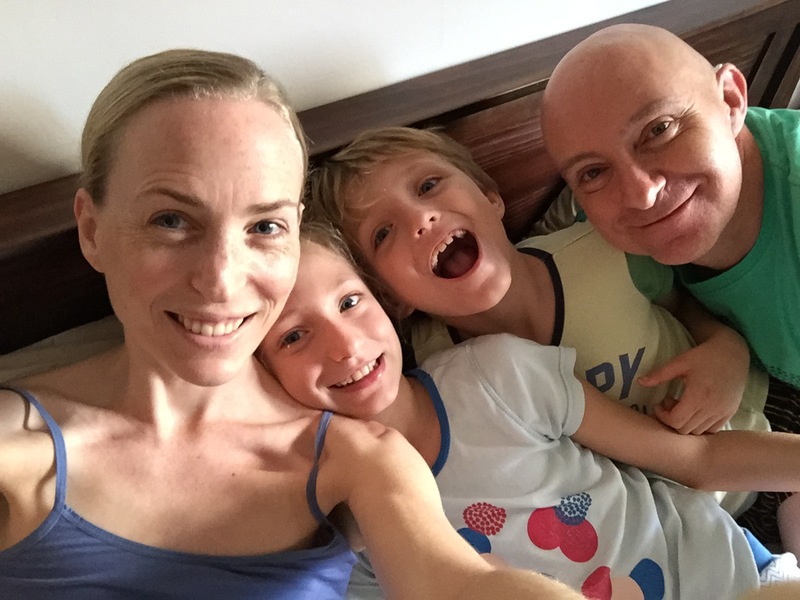 My husband Miles attended a course with the delightful Robyn Treyvaud recently, and realised he wanted to connect more with the kids around gaming, so as not to get left behind, and to be involved in an aspect of their lives that was very important to them. While home sick, I hashed out a possible approach. If you’re going to have this sort of conversation with your kids, there are bound to be some over-arching concerns or areas to discuss. Having a chat with your partner beforehand is important, so you are both on the same page, and can iron out any differences before bringing in the kids. We talked about our ideal scenarios for each of these areas, and agreed on some common understandings before we sat down with the kids. As I mentioned earlier, we wanted the kids to have a positive experience with this conversation, in the hope that open communication channels established now, will reap rewards for us later. We want our kids to feel they can come and talk to us with issues that may arise, now and in the future. I decided to make a proper invitation, inviting them to a Digital PJ Party, which got them totally PUMPED! I thought we could have popcorn and watch a movie together after we talked. I may have overdone the building excitement phase, however… Due to farewells and so on, we were going to have to have the Digital PJ Party a while away, but the kids were so excited about it, they forced us to have it in the morning instead of the evening as I had planned. This worked out extremely well, because there was no rush to get out of bed OR PJs on Saturday morning, which was fine by me! I created a little survey for each of us on a Google Doc, so everyone could write their thoughts down before we kicked off the par-tay. While we drank coffee and attempted to wake up, the littles answered their questions. 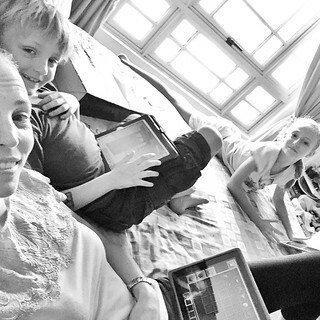 There were questions about how much screen time they thought was reasonable, what their favourite things to do on digital devices were, what they liked doing together with us, and what was important for us to understand, from their perspective. Miles and I also filled in the parent survey. It had similar questions, but a few extra ones about things we were worried about, and things we wanted our kids to understand. We kicked off our chat with the kids sharing their answers to the questions. That was interesting in itself! Giving them the chance to share their thoughts, meant that issues we thought might be hard to tackle, were actually a breeze. By way of example, Miles and I agreed on a screen time limit we were happy with before we had the party. 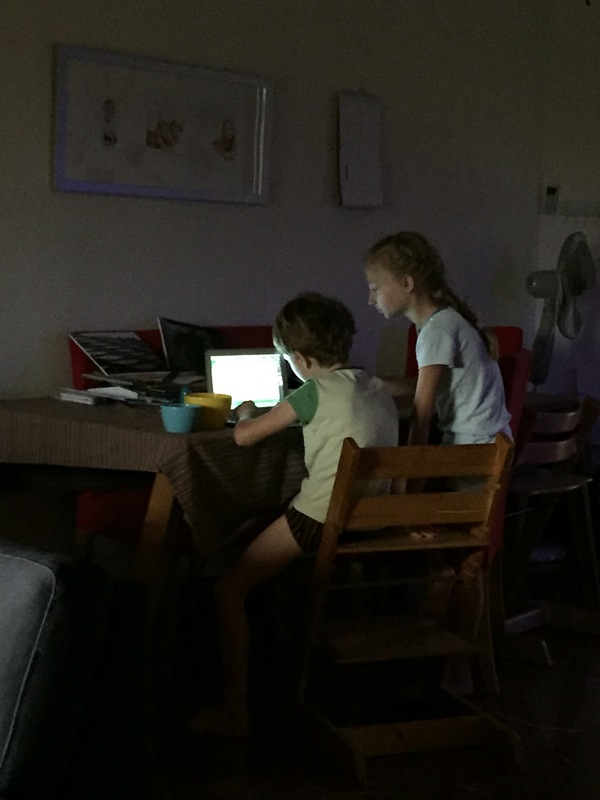 It turned out the kids both suggested exactly the same time limit as being a reasonable amount of screen time to have on the weekend, which meant we had no arguments at all over that. Trust between parents and children is a lot like a rubber band. Pull too tightly, without giving enough responsibility, and you may find your children hide things from you, so as to have a chance to experience them. Hold too loosely, and give too much responsibility too soon, and they may find themselves out of their depth. We explained to our two that we felt we had held too loosely to the rubber band, and as a result, we had lost some trust in them – partly our fault, partly theirs – but there were some areas where we had to pull the rubber band back in. This metaphor seemed to resonate with them. They seemed to understand why certain boundaries were put in place, and it wasn’t a hard conversation. Although we didn’t have a hard time with the conversation, it wasn’t particularly upbeat after the boundaries aspect of the chat. We wanted to finish with a digital activity we could do together. Some ideas we had included a movie with popcorn, or playing Minecraft together on the iPads. As it happened, we decided on another approach. The littles had been on and on at us about getting an XBox or Playstation so they could play games together. We held off for a long time. We decided that this could be the perfect opportunity to show that we had been listening to what they wanted, and reinforce some of the new regulations we had put in place (e.g. no unsupervised computer time) by changing platforms from a computer, to a gaming platform instead. 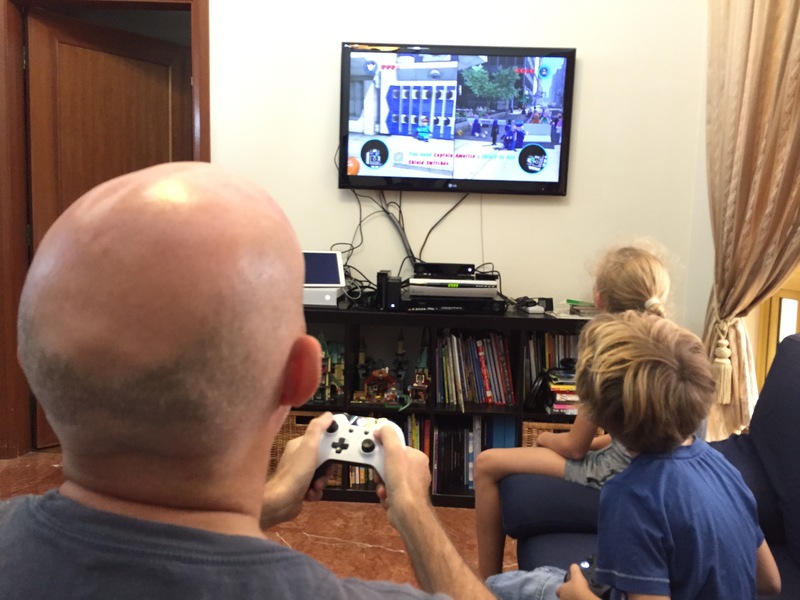 Gaming platforms are more limited in their scope, and it is easier to prevent the link-hopping that can get kids into trouble on the computer. We proposed that if they were prepared to contribute a sizeable sum from their pocket money, we would pay the remainder towards an XBox One. We explained that the time limits we agreed upon would still be in effect, but that we hoped there would be opportunities to play together as a family, especially over the holidays. The littles were totally stoked! We went shopping together later that day, and that afternoon, the kids were showing us the ropes. It has only been a few days, but we have had no issues with the new guidelines, and everyone seems pretty clear about being on the same page. I will update in the holidays to see how long this digital peace lasts! I don’t have all the answers, but I feel like at least I have made a start. 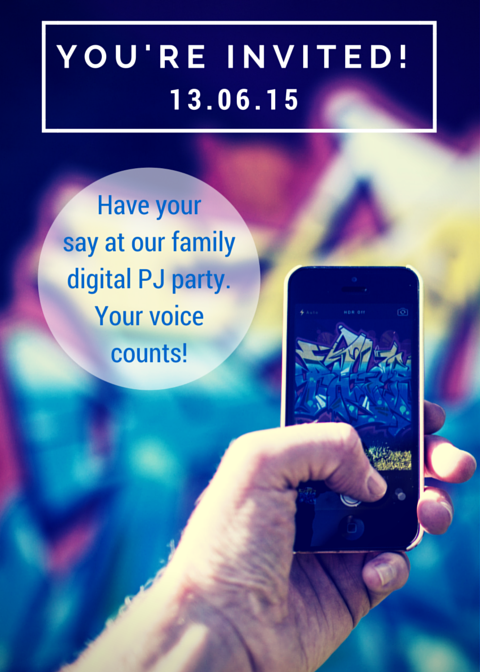 Digital Citizenship is going to be an ongoing topic of conversation in our household, that much I know. What approaches have you tried with your kids? What suggestions do you have for us? I value your input. My colleague Dave and I work on many collaborative tasks. Our antiquated system for managing these tasks was a post-it note that Dave kept on his desk, that we would occasionally look at and cross things off. 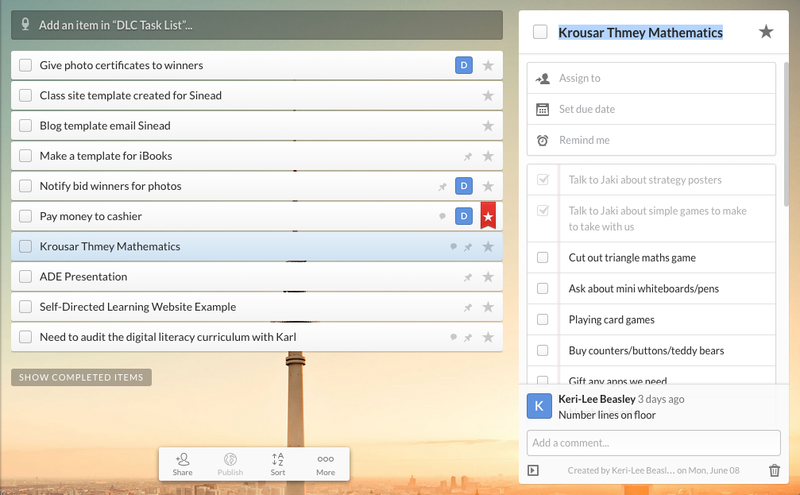 Our MS/HS colleagues Adrienne and Jeff had been talking up using Wunderlist to stay on top of their To-Do List, so we thought we’d give it a go. Working across multiple platforms – I can access my Wunderlist on my iPhone or on my browser. There are a number of compatible platforms (including Android, Windows and Apple Watch) that let you check off your task list from whatever device you happen to be using. Multiple Lists – I have a grocery list with my husband, a DLC Task List with Dave, a list with my sister in NZ who is visiting soon and wanting to know what to bring. 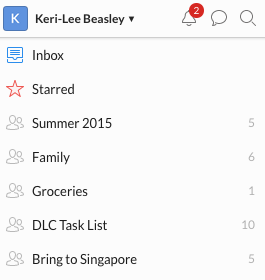 The ability to have multiple lists makes it easy to manage the different aspects of your life. Adding Subtasks – There are many occasions when a big task needs to be broken down into multiple subtasks, and Wunderlist enables you to do this easily. Really handy to be able to feel like you’re making progress on those huge jobs! Assigning Tasks – Dave and I can assign our big tasks to each other, or leave them for both of us. It’s nice to be able to see quickly what you are responsible. Reminders – Time based reminders can easily be synced with your calendar. We are using Sunrise on our phones to manage our Google Calendar, which works a treat. Commenting and Notes – We can comment or write notes on tasks, clarifying new additions or reminding each other about things that are upcoming. Great feature. Attaching files – Adding a file, dropbox link or voice comment is another handy feature of Wunderlist. The ability to assign sub-tasks would be helpful. Linking to a file in Google Drive (although we can add links in the Notes section). The ability to undo the last action – especially useful for accidentally checking off the wrong item! It can be retrieved with a few clicks, however undo or command + Z would be quicker. Why not give it a go with your team?